A swan plant is a perennial that has attractive white flowers and large seed pods. The plant is from the Milkweed family and is a major source of food for the Monarch butterfly caterpillar. Swan plants are sown in the garden as seed and grow readily, sometimes to 6 feet high. 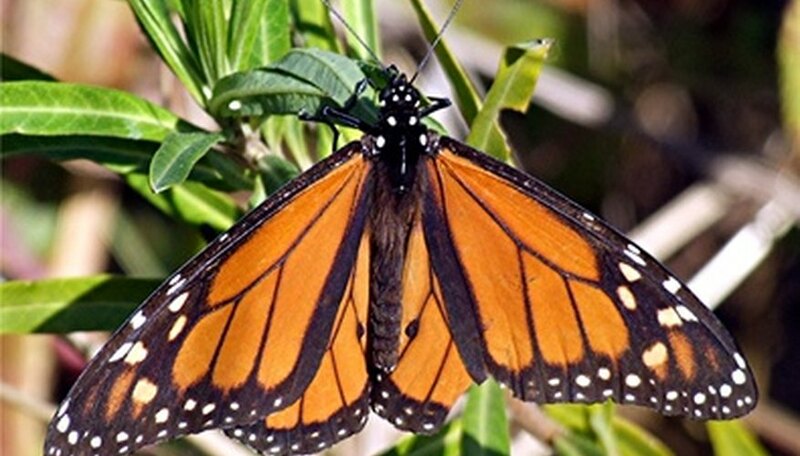 The plant is commonly grown by butterfly gardeners to attract the Monarch and give them a place to lay their eggs. The plants are consumed almost in their entirety by the time the caterpillars are ready to spin their chrysalis. Choose a location that has full sun to part afternoon shade. Use a shovel to scrape off the top layer of lawn turf and weeds. Place 2 inches of compost over the soil and turn the ground over with a shovel to a depth of 4 inches, working the compost into the soil. Rake the bed out leaving slight ruts for the seeds. Place seeds 6 inches apart on the soil in one of the rake ruts. Cover the seeds with a quarter-inch of soil and water lightly but thoroughly, so as not to wash the seeds away. Keep the soil moist while the seeds germinate. Cut the watering back to twice a week once the plants sprout. If the weather is especially hot and dry, water more. Place stakes next to the swan plants if they get too tall and start to bend over. Carefully and loosely tie the plants to the stakes to give them room to grow. The plants can also be tied to a fence if they were planted next to one. Do not use any insecticide on the plants or any other plants close by or it will kill the caterpillars. The caterpillars will consume most of the plants. In the fall, any remaining plant can be cut to the ground and will come back next year. In very cold areas, mulch over the bed for the winter to protect the roots.